Hayden and Halle: Wow! Hayden is 4 months old!!! Wow! 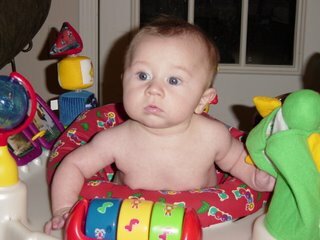 Hayden is 4 months old!!! Four months have flown by, and Hayden has changed so much! He had his check-up and shots (not fun!) on Tuesday. He weighed 14 pounds and 6 ounces and was 23 3/4 inches long. He's around the 50th percentile in weight and the 25th in length. (Sorry Hayden, you don't have much of a chance of being tall with a short Mom and Dad :-) Just before he turned 4 months, he mastered rolling from his back to his belly. He starting rolling to his side to sleep (see pic above) a few weeks ago, and he finally made it over. He rolled from his belly to his back a few times when he was only 5 or 6 weeks old (probably by accident), but he's only done it a few times since then. He also loves his Baby Einstein activity center (in pic) because he can practice standing, which he really loves to do now. 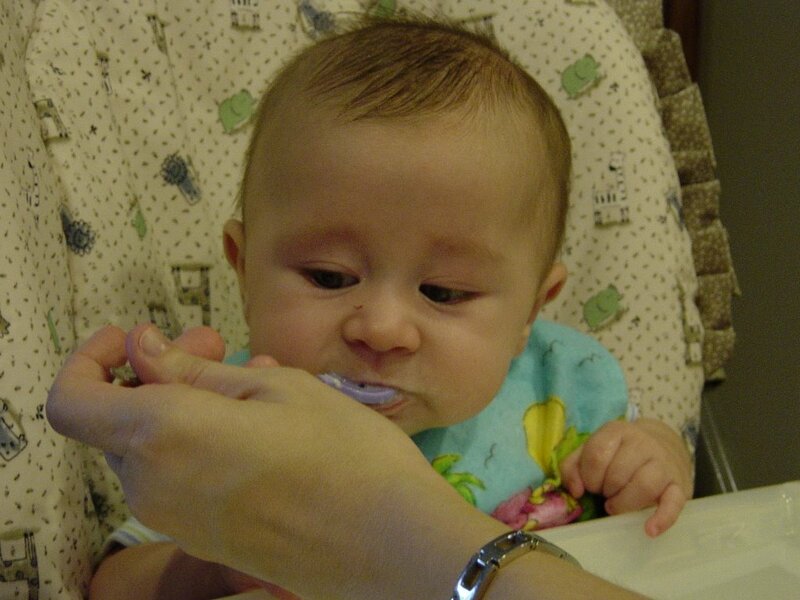 Another first, we tried Rice Cereal yesterday to see what Hayden thought. As you can see, it was a little messy. He wasn't sure what to think, but he did pretty well with the spoon! We have more fun with Hayden everyday! he looks so big in that seat!! I can't wait to see him again!! I am missing out on a lot!! Who are people saying he looks like?? I think I see a little of both of you guys!! I am glad that you are having so much fun with him!! The bottle thing at church was too funny!! I am sure people would have understood!! Well I hope to talk to you guys soon! What a cutie!! Maybe he and Baylor can hook up someday! 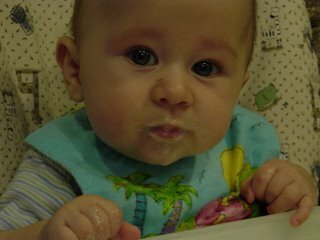 I miss you and glad you are enjoying mommyhood--even with the embarassing milk spill:) It made me laugh. Take care. Louis vuitton Outlet regarding low-cost will provide you with an excellent possiblity to acquire that together with method value. --! @yibin. outlet coach to get this costly purse. chenjiansu1018. Coach Online Store, over the reverse of present, two or three happen to be the following: train Eden End user - It is actually an added good backpack which would likely get not anymore overly brilliant however gives a better way for layout. chenjiansu1026. Need a Laugh? Read This!